Right now, we're doing a project with class no. 24 at BAS, that's apparently called "Where strangers are likely to meet" ("Rom for ukjente" in Norwegian). As in all projects, we've started with little assignments called "quick assignments". The first we did was to document a public space that we liked. 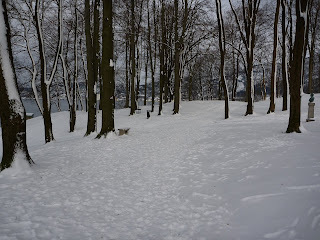 For this I chose the beech grove at the Nordnes park in Bergen, and made some drawing and took some pictures (the one with the trees is taken there), and some of the drawings can be seen in the background. I like this kind of silent public space, where people aren't too noisy, but still don't ignore each other, and will usually give a nod as they pass you by. The nice, expressionist drawings at the left aren't mine, though, they're Ivar's. The second project was meant to enhance a public place and be rather universal, so I just made some hexagon columns out of pinkish granite in different heights and put them together, to form a sculpture and sitting place. Half of each column is buried underground, and for the public to know this, an engraving of the work drawings including the one showing this, will be found on each column. The model was made from brown and grey cardboard glued together, and then coloured pink. Yours truly in person on the left, concept model made out of home made play-doh to the right. 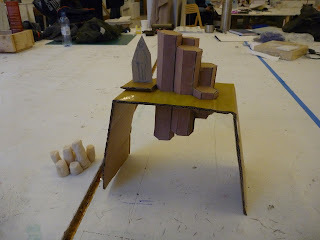 The third assignment was to make a 1:1 sketch model in a public space of an element that needs to be made clearer; something which I did today. Pictures and stuff about this later. When we get the text for the project order tomorrow or Friday, we'll have about two weeks to finish the thing. 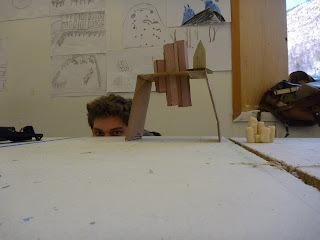 Looking forward to working in the studio with my rather brilliant and creative co-students.